The U.S. Department of Commerce (Commerce) creates the conditions for economic growth and opportunity by promoting innovation, entrepreneurship, competitiveness, and stewardship informed by world-class scientific research and information. Commerce places a premium on effectively and efficiently delivering customer services. Customer Service is one of the six major themes of the Department's Strategic Plan and Balanced Scorecard, which the Secretary uses to track each bureau's progress towards key programmatic and management goals on a quarterly basis. Accordingly, Commerce includes customer service goals and objectives in the performance plan for every employee throughout the Department. 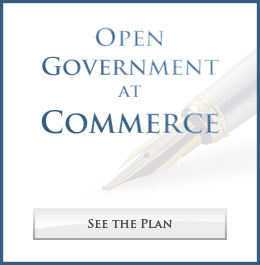 As required by Executive Order 13571 on Streamlining Service Delivery and Improving Customer Service, Commerce has developed a plan that identifies specific actions and initiatives to further advance its customer service delivery over the next year, focusing on key service areas and technology-driven initiatives. This plan outlines the key elements of these initiatives. Our first initiative is Commerce Connect, a collaborative partnership of all Commerce bureaus to streamline public access, through a one-stop model, to over 70 Department-wide programs that support U.S. businesses. Our other initiatives represent best practices of individual bureaus. The International Trade Administration is upgrading the content and navigability of its web site in support of the National Export Initiative. The U.S. Patent and Trademark Office is pursuing several projects to provide ready access to its backlog and pendency metrics, to accelerate its examination of patents for environmentally-friendly and conversation technologies, and to make bulk patent and trademark data readily available to the public, free of charge, on Google. The Economic Development Administration will implement customer surveys on its upgraded grant application process, launch a microsite to highlight best practices in regional innovation, and facilitate the exchange of innovative ideas and perspectives in economic development. The Bureau of Economic Analysis has upgraded the features and functionality of its web site and will survey users for their feedback. The U.S. Census Bureau has implemented a search tool that enables readily searchable and exportable access to detailed economic data. Lastly, the National Oceanographic and Atmospheric Administration is working to preserve and enable searchable public access to the extensive multi-agency data related to the Deepwater Horizon oil spill. To ensure that everyone can participate in polite conversation, this blog is moderated. For detailed information on how and what we moderate, view our comment policy.